The Stamp Simply challenge #120 over at Sharon Johnson's blog today is to use "New" things on our projects. 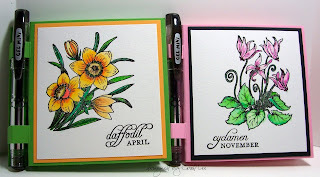 My most recent purchase was Flourishes calendar flower stamps and I couldn't wait to ink them up and create something. This is only a sampling of the flowers, but there is one floral image for each month of the year. I thought these post-it note holders would be a hit because you can personalize each person's birthday month with their own special flower! I've only just begun and I'll have to make lots more of these after I get some post-it note pads and mini pens. The images were stamped with Versafine Onyx Black ink, embossed with clear ep, and colored with Tombows. I figured out the measurements for the covers on my own, and if anyone wants them, I'll be glad to share (email me). I soon realized that not all post-it notepads are the same size or thickness, so I'll have to adjust the measurements for some. I used PTI's leaf green and summer sun on one, and SU! 's pretty in pink and basic black on the other. Thanks for a great challenge Sharon, and thanks for stopping by on the first day of 2010! Have a wonderful new year's day!! Awesome coloring on those pretty flowers! Fun project today...Happy stampin in 2010! Very nicely done...these beauties have caught my eye on other blogs, so nice to see them here! Thank you, Carol. What a lovely mid winter to have for crafting during a Sunday after worship services candy and cookie exchange. The previous gathering was over a dozen gals each bringing four or more dozen cookies and delicate sweets where we made creche shadow card faced A2s and red foil on white glossy scalloped edge circle topped with many pointed snowflake hung by red crochet string! Oh! the mountain of cookies each lady took home on every one of her three plates!! She had already taste tested at least a third of them before the exchange 'walk around'~ ~ The tummy was not tempted at all to unload in below zero car so as to sneak! All cookies safely landed at each new home. You betcha! Thanks for the project guide. OH MY! I love these -- I have not inked up my Florals from FLourishes yet-- but I'm itching too now! Beautifully colored! What darling holders and a GREAT ideas!!! Love these -- so glad you played along with the Stamp Simply Challenge!! !